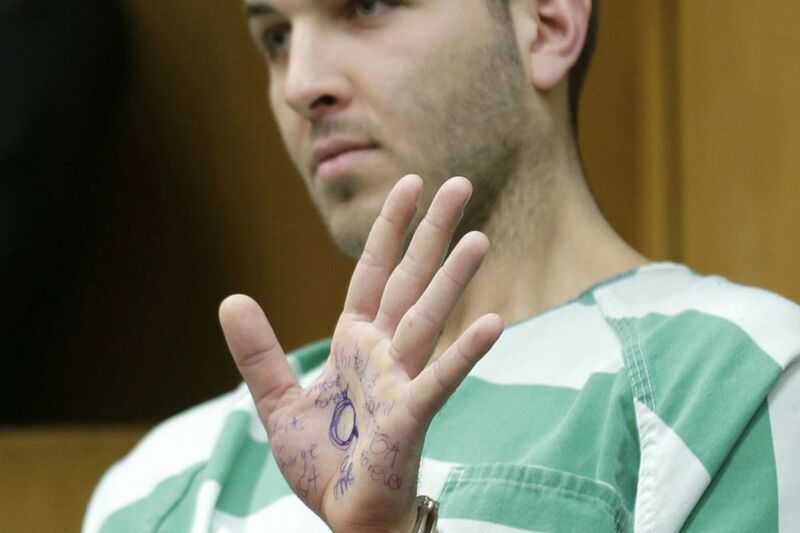 Anthony Comello displays writing on his hand during his extradition hearing in Toms River, N.J., Monday, March 18, 2019. New York City police say a suspect is in custody in the shooting death of the reputed Gambino crime family boss. Chief of Detectives Dermot Shea says 24-year-old Comello was arrested Saturday, March 16, 2019, in the death of Francesco Cali on Wednesday in front of his Staten Island home. During the hearing, Comello did not speak other than to say, “Yes, sir,” to the judge to several procedural questions. The 53-year-old Cali, a native of Sicily, was shot to death last Wednesday by a gunman who may have crashed his truck into Cali's car to lure him outside. Police said Cali was shot 10 times.